The rain was pelting down as we left Leeds in a convey of 2 accessible mini-buses and a coach filled with wheelchairs and volunteers to push them, but the sun was shining for us by the time we got to Blackpool. Our second trip there this summer – this time for those who might need a little extra help. 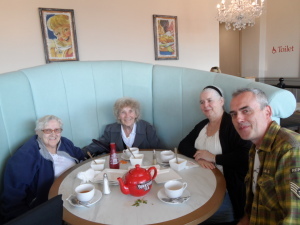 And what a lovely day we had strolling round Blackpool and stopping for a lovely lunch of fish and chips. A huge thank you for all our amazing volunteers who pushed wheelchairs, lent an arm to someone who needed it and did everything they could to make this a successful day out. You all worked really hard and we are very grateful! !